New York, NY (October 28, 2015) Throughout history, visual artists have been inspired to capture the complex as well as the sublime qualities of nature and its life-forms. Scientists have done the same via observational recording, classification, counting, and analysis. Because of their baseline reports, we now know the truths of today’s rapidly-increasing biodiversity/extinction crisis. Additionally, the science of ecology, tells us how this loss affects every human, as we are the interconnected “top predator” of all life on planet Earth. reflection, critical thinking, dialogue, and hopefully individual actions on the issues we face surrounding loss of biodiversity and species extinction. (1) Bengtson+Wetherwax turn a scientific field experiment into an amusing inter-species cultural exchange in their mixed-media video work called Teaching Aid. (2) Jon Goldman’s provocative Aphoristic Extinctions series is a pithy observation of how humans use language to cynically express fear and justify estrangement from wild animals. 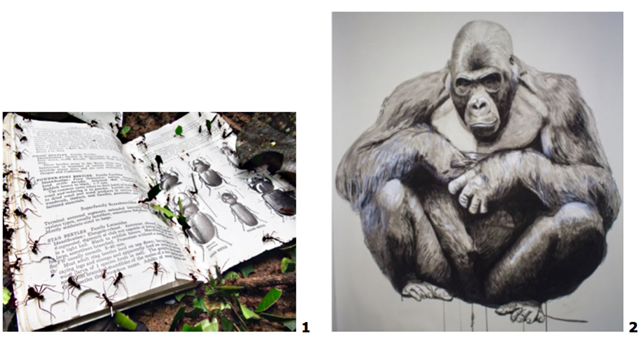 (3) Hetty Baiz’s early and deep connection to the importance of nature’s web-of-life, translates easily into her recent collage series of magnificent wildlife threatened by extinction. (4) Bec Bigg-Wither’s collage, I’d Kill To Be Like You – Air, is an ode to the freedom of our feathered aviators of the sky, while lamenting that science alone cannot protect them. (5) Angela Gonzalez’s mixed-media artwork, BIOS – Basic Input Output System, heralds the life-sustaining systems of trees and the necessity for a balance between people, planet, and profit. (6) Gina Duque’s mixed-media works on canvas celebrate the structure and power of seeds to sustain human civilizations with their common ability to survive long periods in dry, barren lands. acknowledging that both negative and positive collective actions can make a difference. (8) Lauren Strohacker’s Encounter project places free-standing cut-outs of mule deer in downtown Phoenix to stimulate dialog about cohabitation versus conflict in our current Anthropocene Era. (9) Joseph Ingoldsby’s poignant 2D “memorial,” The Last Migration, reflects on the loss of two keystone bird and fish extinctions by man’s actions over just a 100-year time-span. 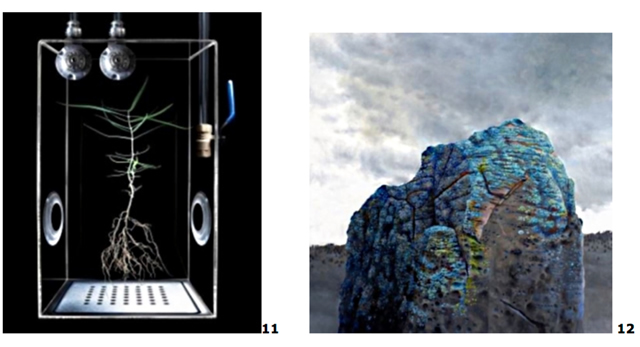 (11) Donna Davis’ digital print, Life Support, acknowledges the life support services plants provide humans and envisions a future world where man’s machines try to keep them alive. (12) Ashley Williams’ oil painting, Sleep And Its Consequences, from her Sentient series on lichens, emanated from learning how they help scientists determine local pollution levels. (13) Michael Felber’s concern about species extinction is viscerally sensed from his exquisite, up-close illustration, Grandfather, of the threatened Alaskan brown bear. (14) Jaden J.A. 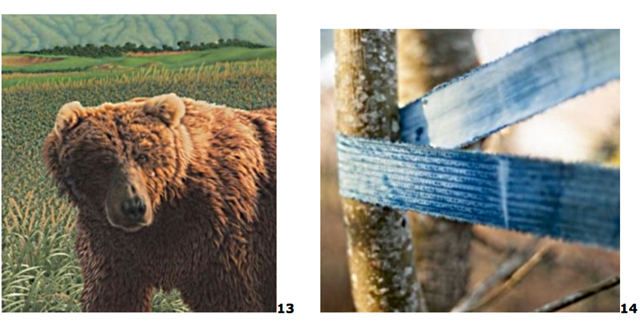 Hastings’ installation series, On the Subjugation of Nature, is uniquely Anthropocenic – trees are bound by a strip of fabric printed with their sequenced genome. (15) Lea Kannar-Lichtenberger’s study of the evolutionary dynamics of dandelion weeds provoked her artwork, Life I, questioning our present monoculture agriculture and society. (16) JM Landin’s Carapace Cornucopia delights in the patterns and colors that result from the adaptive camouflage of turtles — a trait that contributes to their sustainability. (17) Lee Lee’s Alewives is from her mixed-media DEBRIS series on ocean plastics, which initiated the formation of the international Debris Project that highlights the ecological impacts of single-use plastic. (18) Jon Wyatt’s photograph, Waterlogged Fields, Monkton, South Wales, is from his The Sixth Extinction series and a result of his field reconnaissance inspired by learning of leading paleogeologists investigating clues in Wales to a 200-million year old global mass extinction event. 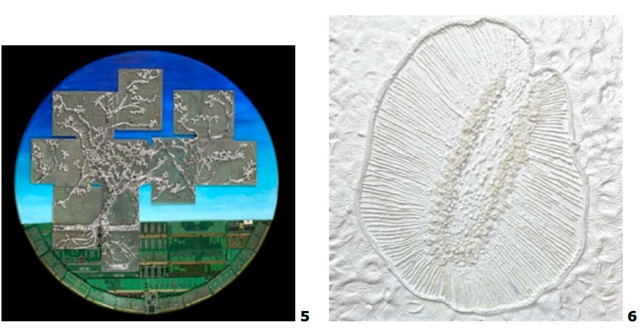 (19) Elizabeth Bajbor’s artwork, Life, emanates from her biological perspective that all life forms are “data storage systems” whose evolved genes can benefit future generations. (20) Dash Masland’s photograph, It’s a Microbial Matter, prods us to see DNA’s beauty, as well as the crucial role microbes play in conserving our planet’s interconnected web of life. 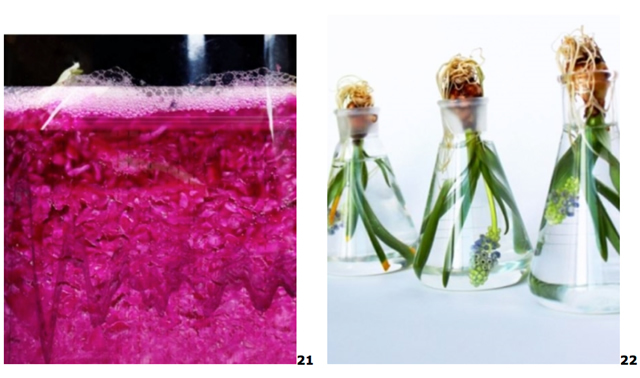 (21) Nadir+Peppermint’s Microbial Selfies series springs from their ingenious electronics and custom software that enables food fermenting bacteria to take “selfies” that reveal the unseen services microbes provide us. (22) Yoko Shimizu’s intriguing Underwater Efflorescence installation series is from her lab experiment growing flowers to blossom underwater in order to study species adaptation to environmental change. (23) Beth Krensky’s imaginatively crafted Portable Altar and Wish objects are perfect for rituals designed to sanctify and inspire human protection of our rapidly diminishing natural world. Because scientists are taught not to bring emotions into their research, it is thrilling to see that an increasing number of contemporary artists (and scientists!) are taking on the challenge of using their art to present complex scientific issues in humanistic ways that question our ingrained thinking. Only in this manner will we search for humanistic, cradle- to-grave solutions to today’s most critical problems. 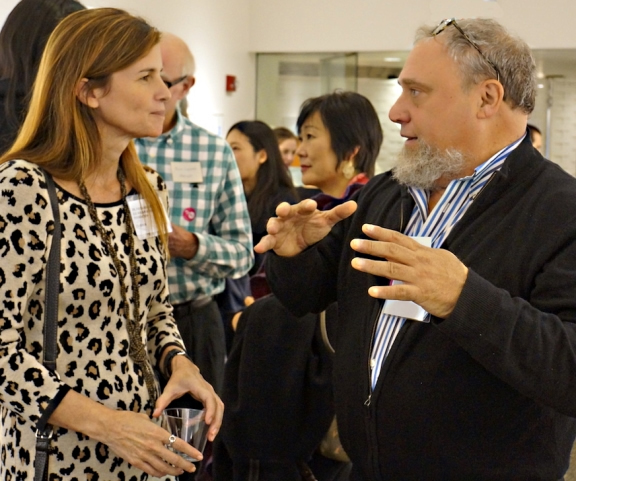 Science co-juror Paula Ehrlich with exhibition artist Jon Goldman. Photograph by Marcia Rudy. “CITY SIGHTS: Finding the Science-Art in New York Area Art Exhibitions.” By Julia Buntaine. SciArt in America. November 11, 2015.